The 2nd Annual Aggie Award took place on Monday April 28th, at the Corbett Center Ball Room. Awards were given out to Individual Student Athletes, Teams and Coaches. LAS CRUCES, N.M. -- This past Monday, NM State student-athletes, coaches and administrators gathered for the 2nd Annual Aggie Awards Banquet, an end of the year ceremony to honor student-athletes, coaches and their supporters. In all, 20 awards were handed out at this year’s event. 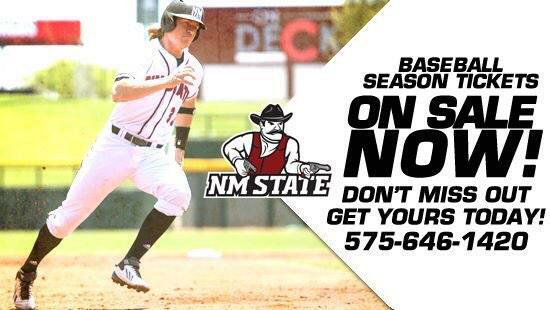 Mr. Aggie, the award given to a player who displays what it is to be a true student-athlete at NM State, was given to sophomore outfielder, Joseph Koerper of the Aggie baseball team. Christy Barela of the track and field/cross country team and Terrin Seaver of the swimming and diving team were both chosen for the Ms. Aggie award. Former NM State football player, Miles Washington, sustained a serious injury that was diagnosed as a cervical fracture of the spinal cord during a practice on April 13, 2013. For the courage he displayed through his battle towards recovery, an award was named after him that is intended to be given to the male and female student-athlete who persevered through adverse circumstances and represented NM State with pride. Clint Barnard of the Aggie football team and Jenna Banegas from track & field were the male and female recipients of this award. The Male and Female Athlete of the Year award was essentially the MVP trophy of the night. This award was given to the male and female athletes who performed exceptionally well within their sport. Junior outfielder, Staci Rodriguez was chosen as the Female Athlete of the Year while junior guard, Daniel Mullings was selected as the Male Athlete of the Year. The women’s volleyball team walked away with the Female Team of the Year award, while the Male Team of the Year award was given to both the men’s golf and the men’s basketball team. Miss Aggie: Christy Barela and Terrin Seaver. Mr Aggie: Joe Koerper (Baseball - Not pictured). The Joe and Van Bullock Athletes of the Year Award are Staci Rodriguez from Softball and Daniel Mullings from Basketball.